Bloomberg just published a story about how we’re about to see a “multibillion dollar rush of deals” in the lithium space. Too bad that it didn’t give any worthwhile picks in its story. Ladies and gentlemen, I’m here to rectify that. I’ll give you two top picks today. First, yes, we will see a huge rush of deals. The lithium supercycle is stoked by the electric vehicle (EV) mega trend. I’ve written about both lithium and the EV mega trend for Banyan Hill. You see it in the headlines every day. Ford plans to roll out 40 electric vehicles by 2022, an $11 billion investment. Volkswagen is spending $24 billion. Porsche is doubling its investment in electric cars to $7.4 billion. And all this is put to shame by the full-throttle approach of Chinese carmakers. Every forecast for EV adaption has been too low. I can’t emphasize this enough. Every. Single. One. Look at this chart showing estimates of how EV forecasts have changed over time. The earliest is a pink line on the bottom. The blue line going ballistic is the most recent. I wonder what the forecasts will look like later this year. Or next year. And all these programs require lithium. Then, last month, analysts from Morgan Stanley rolled out a forecast for a sudden drop in the price of lithium. They forecast that lithium prices would fall 45% by 2021. The market was frothy. That froth rushed out like someone pulled the plug. Is Morgan Stanley right? Heck, no! To get to its oversupply scenario, it assumed every single lithium project would be developed. Any miner worth his salt would tell you that just doesn’t happen. Heck, odds are 50-50 that any mining project will run into some trouble that delays it. Still, this bearish forecast was enough to give the industry a collective heart attack. The price of lithium stayed strong. But lithium mining and industry stocks, as tracked by the Global X Lithium & Battery Tech ETF (NYSE: LIT), went into a steep slump. 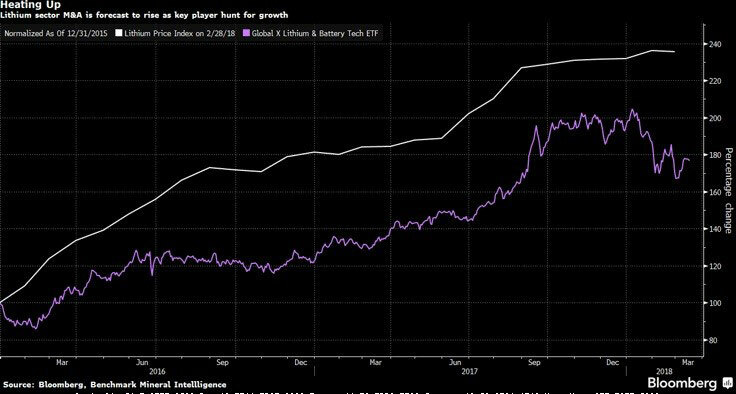 On this chart I grabbed from Bloomberg, the white line is the price of lithium. The purple line is LIT. As you can see, LIT is off its highs by nearly 16%. The fundamentals of the mega trend and the market it drives haven’t changed. To me, this means great lithium miners and explorers on sale. Others, like big lithium miners FMC Corp. (NYSE: FMC) and Albemarle Corp. (NYSE: ALB), have rolled out their own forecasts. Very bullish forecasts. We have seen repeated examples of new entrants making large claims about intended capacity additions that are ultimately proven to be far too ambitious. … [Moreover,] simply adding mining or extraction capacity will not be enough [to meet demand] without the corresponding increase in manufacturing capacity for battery-grade lithium products that are in a form that the customers can use. In other words, hold onto your hats. The lithium supply/demand squeeze is coming. You can play this in two ways. The LIT ETF. This exchange-traded fund invests in the full lithium cycle, from mining and refining the metal through battery production. But it is very exposed to miners. Sociedad Química y Minera de Chile (NYSE: SQM). SQM is the biggest lithium producer in the world. Now it is expanding its lithium production capacity to 70,000 metric tons this year from 48,000 tons last year. By 2019, it will raise production to 100,000 tons. Wow! The company can quadruple production by 2025. There is 32% of SQM up for sale. If there’s a fly in the ointment, it’s that Chile’s development agency, Corfo, stepped in to block China’s Tianqi Lithium from taking a stake in SQM. I expect the piece of SQM that is up for grabs could go to a major car company that wants to lock in lithium supply. As an individual miner, SQM carries more risk than LIT, which is diversified across the lithium space. But it also has potentially more reward. No market travels in a straight line. And in bull markets, consolidations are a good chance to get in on the cheap. The next big leg higher in lithium is coming. Be ready when it hits.